For an exterior look that provides the beauty and texture of wood, but provide much better durability and lower maintenance costs, Krech Exteriors recommends HardiePlank® lap siding from James Hardie. Longer life, exceeding wood, shingle, stucco or vinyl siding. The fiber cement composition of HardiePlank® stands up to virtually any weather and remains intact and protecting your home. It won’t contract and expand like other siding materials. Superior protection. HardiePlank® lap siding is up to five times thicker than vinyl, so it stands up to snow, ice and hail, and is rated for winds of up to 150 mph. Resistance to fire and pests. Fiber cement resists fire much better than vinyl or wood, and is immune to insects and rot. Exceptional beauty. The built-in pattern of a HardiePlank® board looks just like wood, but will not fade or split. Less maintenance. Unlike wood, shingle or stucco siding, HardiePlank® requires very little care to retain its beauty. You can easily clean it with a garden hose. Paint less often. HardiePlank® lap siding does not need to be repainted every few years like wood. Fiber cement holds its color up to three times longer without fading, chipping or cracking. But you can change colors! Vinyl siding does not need to be painted, but you can never change vinyl’s color. If you wish to give your home a new look in the future, you can paint your HardiePlank® siding any shade you choose. Sustainable materials. Fiber cement is composed of cement, cellulose fibers and sand. So no endangered trees are sacrificed to make up this strong, durable material. 30-year warranty. 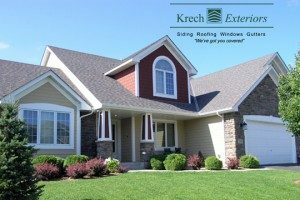 No other siding material can approach the 30-year warranty you’ll get from James Hardie when you choose a factory-approved Minneapolis siding contractor like Krech Exteriors to install your siding.